Transfer to your next destination, Bus Station or your hotel. 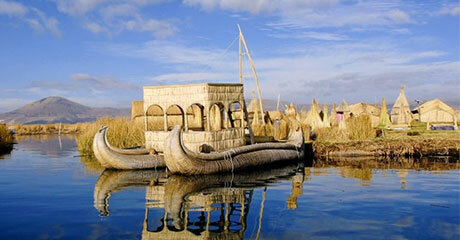 Tour to Sillustani and transfer to the Airport in Juliaca. 02 Night at selected hotel. 02 Breakfast buffet (3 and 5 stars) Continental 2 stars. Entrance Ticket Uros and Taquile Island. Transfer We will be waiting for you at the Bus Station in Puno to take you to the selected Hotelwhere you can rest untill next morning tour. CHULLPAS OF SILLUSTANI AND TRANSFER TO JULIACA'S AIRPORT After Having breakfast and once we're ready we will head to Juliaca's Airport ( 1hr from Puno) ,but on the way to the Airport we will visit the Chullpas of Sillustani for around 30 minutes.The archaeological site of Sillustani is located 22.3 miles away from the city of Puno (34 Km., 35 minutes drive) and at an altitude of 12,858 feet (3,840mts.) above sea level. This visit allows visitors to enjoy stunning highland landscapes and imposing pre-Inca architecture. The site is strategically positioned on the top of a peninsula surrounded by a beautiful lagoon called Umayo lagoon.